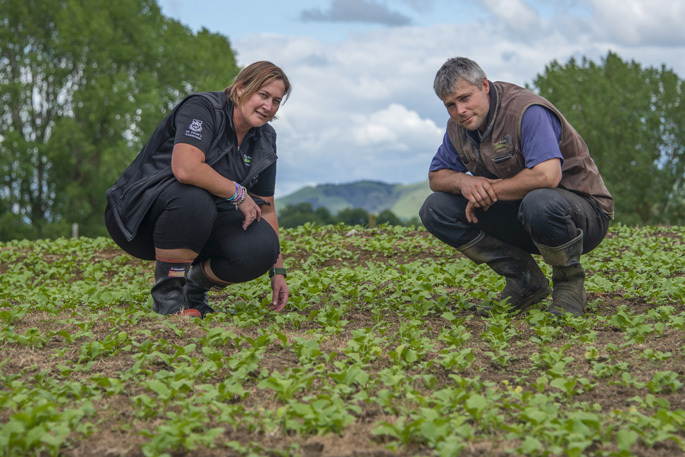 Owl Farm demonstration manager Louise Cook and farm manager Tom Buckley inspecting the turnip crop. Owl Farm has been part of St Peter’s School at Cambridge for more than eight decades. From 1936 its purpose was to feed 200-odd boys boarding at the school. Orchards and the dairy unit were part of the school’s self-sufficiency. Today the farm is a commercial, 400-cow dairy farm with a demonstration unit and role models responsibilities for dairying in New Zealand. In 1974, the farm became a fully commercial dairy farm and over the years has been expanded from 80 hectares to 148ha. Profit from the farm is invested in the school, or re-invested in the farm as required. In 2014, the school entered a joint-venture partnership with Lincoln University, and with seven industry-based partners the demonstration farm became a reality. Monthly meetings plan the way forward for the farm with the partners also sitting at the decision-making table. Demonstration manager Louise Cook says the Owl Farm’s three years as a demonstration farm have been filled with change. So the farm management committee decided to make two fundamental changes to the farm’s performance. First, to improve profits by increasing milk production from home-grown feed. The second was to continually the farm’s environmental outputs. “We had to demonstrate both economic and environmental viability and sustainability for everything we did,” says Louise. Feeding out expensive maize silage in-paddock resulted in a lot of wastage and damaged pastures, as the farm has no feed pad. So more focus was aimed at the paddocks that were not performing well, with considerable re-grassing, and a strong summer forage crop plan. The herd’s diet of home-grown pasture, turnips and silage is supplemented with small amounts of palm kernel, and baleage being brought in. The number of cows has been reduced too. The 2017/2018 season 418 cows produced 168,000 kgMS, and 1136 kgMS per hectare. “Our cow numbers are lower and this meant producing a little less milk, but profits have risen steadily,” says Louise. During the last three years the farm has seen a 50 per cent lift in profit, achieved a 55 per cent reduction in brought-in feed, a 24 per cent reduction in nitrogen leaching, and a 31 per cent reduction in phosphate loss to waterways. “All these figures take into account any economic outlays we have had,” says Louise. And the farm still manages well with its 36-bail rotary cowshed, which was the second one ever installed in the Waikato. But investments are made when necessary, with recent additions including the re-grassing, a new yard, a new underpass for the cows, and a new effluent pond and system. “If you imagine the wettest winter we could possibly have, we’ve ensured we have 90 days’ storage, so we don’t have to spread effluent on wet pastures,” says Louise. With 4km of Waikato River frontage, the Te Awa stream, and three key wetland areas, compliance with the Healthy Rivers Plan is essential, and the school still invests money into these areas each year to make them the best they can be at protecting the waterways. And with so many visitors to the farm, Louise was quick to adopt a foot bath for all visitors to use, as soon as Mycoplasma Bovis was a mere mention in the South Island. Risk strategies have also been implemented with the biggest risk identified through stock movement, says Louise. Owl Farm has three full time staff; Farm manager Tom Buckley, 2IC La Arni Bayquin, and dairy assistant Malou Obedencio. “Tom is amazing. He has to run the farm in a fish bowl, putting all his statistics on the internet weekly, talking to visitors multiple times a year, and keeping the place clean and tidy for visits,” says Louise. The role of the demonstration unit is to provide educational opportunities for a wide sector of students. Obviously the farm is a valuable “on the doorstep” asset for agricultural, science, maths, economic and business students from St Peter’s School, but it also attracts local, national and international students and visitors of all ages. Louise says the farm is pro-active in adopting new concepts and technology but is not in a position to sacrifice profit for research. However, they do take part in non-invasive research themselves and are very willing to share their results. “We are incredibly lucky to have an asset that can be moulded for the betterment of the industry,” says Louise. Owl Farm is constantly looking to be a leader in this sector of industry and is prepared to keep pushing boundaries and making changes, and openly publish and discuss their findings, both good and bad, says Louise.